Umpqua Brew Fest: Let It Pour! 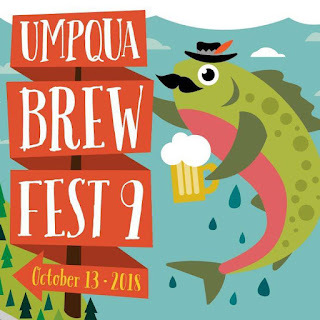 "It Takes A Village To Raise A Brew," and a village of volunteers is ready to serve a valley of tasters at the Umpqua Brew Fest. The folks pulling the taps and filling the glasses are community volunteers, here to serve humanity at our autumn celebration of clean water, craft beer, and sustainable living in the hundred valleys of the Umpqua. Please, be a good citizen of Planet Beer, and be kind to the volunteers! You must be 21 years or older and have valid identiﬁcation to enter the festival premises. Beer tickets or tokens from previous festivals are not valid. No ticket sales after 9:45 p.m.
No beer sales after 10:30 p.m. Smoking is not allowed inside the building. A designated smoking area is provided outside the venue, but smokers must be at least 10 feet away from doors.